Each year when decorating our tree, I like to combine traditional elements as well as a few modern touches. My kid's have a collection of Boyd's Bear ornaments that their grandmother got for them several years ago, so they are on the tree each and every year. The larger bears sit on the tree skirt at the bottom of the tree. They are so festive and fun. 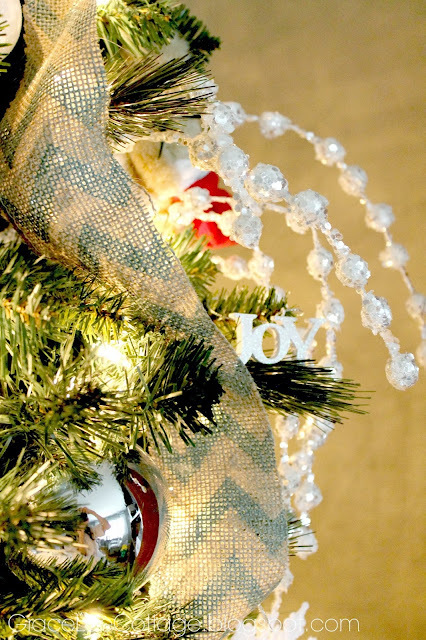 I used the same burlap chevron ribbon that I talked about yesterday as a garland for our tree. I draped pieces of it down the tree starting from the top. Those little spriggy things are from Cracker Barrel several years ago. The rest of the ornaments consist of shatter proof sparkly blue, silver, and white ornaments, snowflakes, and white bows. The Peace and Joy ornaments are from Walmart. Here is a shot of of our tree all lit up at night. 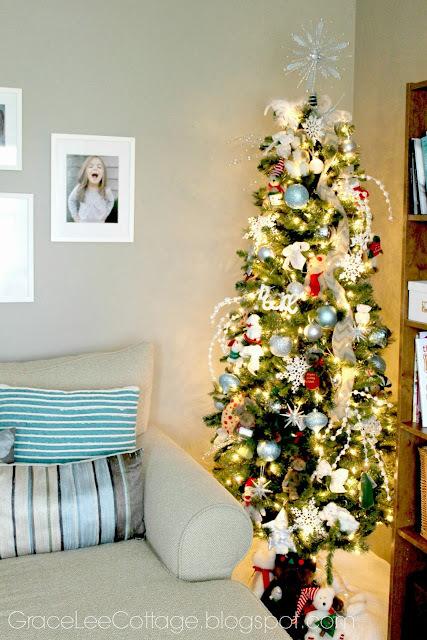 Love skinny trees jam packed with ornaments!!! Thank you! I've been second guessing myself on the skinny tree. 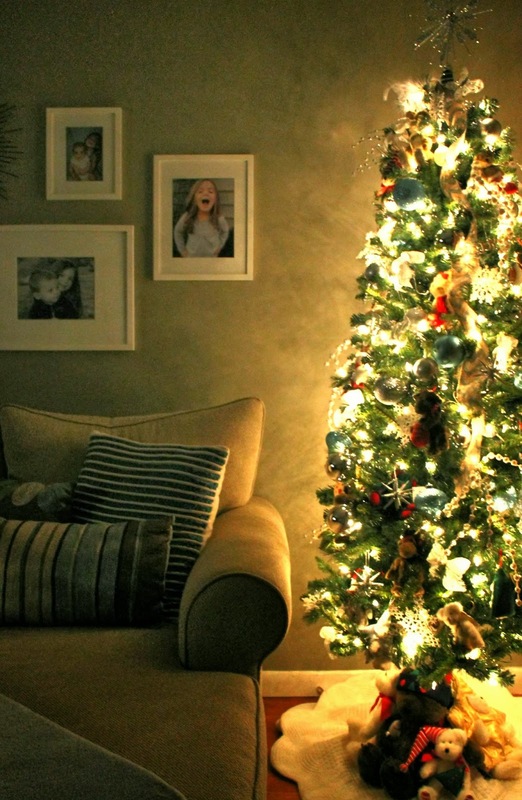 I love full trees but our little living room isn't quite big enough! Thanks for commenting and thanks for stopping by! Stopping by from the link up! I love that your tree has a coordinated look but still holds your children's ornament collection. Sometimes I think I should have two trees, one for our all time favorite and then another one themed. Thanks so much Colleen. 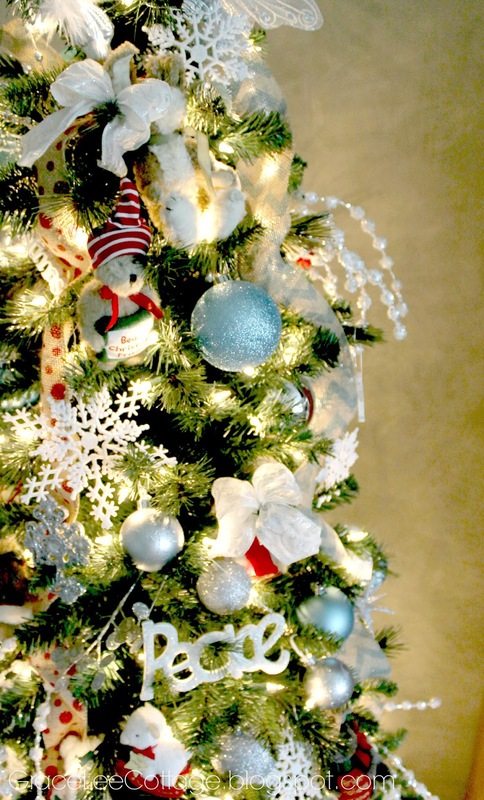 We have a smaller tree in our kid's playroom that has all of their handmade and special keepsake ornaments on it. :) I hope to share that one soon. Thanks for visiting! 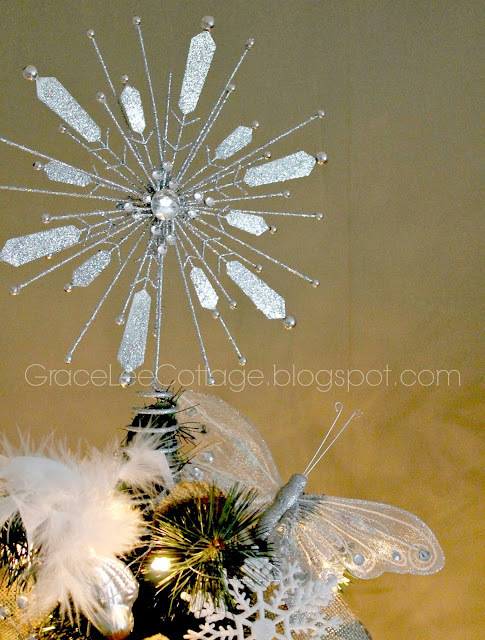 Saw you on "Todays Creative Blog" Your Christmas tree is gorgeous!!!! Thanks so much, how kind of you! Have a wonderful day! Ornaments from Grandma make the tree so special! Thanks for linking up!